Hyderabad the capital of the state Andhra Pradesh is the sixth largest city of Indian Union, is a beautiful city with its mosques,palaces,forts,museums,akes and house lined bazars.The district of Hyderabad is known for its IT and IT Enabled Services, Pharmaceuticals and Entertainment industries, call centers, BPO firms, and other technological services. This city depicts the orient glory of the past especially the Indo-Muslim culture. The testimony of the city is added by its elegant buildings, marbled temples and monuments. The city is nearly 400 years old which still has its culture. Hyderabad, lies on the banks of river Moosi. Hyderabad the citadel of Nizams,who became independent when the Mughal power declined was founded by Sultan Mohammad QUli QUtub Shah of Golconda in 1591.After this the history of Hyderabad begins with the establishment of the Qutb Shahi dynasty.Aurangazeb was very much attracted by the fame of Hyderabad and all its additional features which made him to capture the place in 1687.After his period slowly the fame and wealth of the city started to disintergrtae.then until the union of India the viceroy, Asaf Jah I called himself the Nizam and established independence rule of the Deccan.His successors the Nizams remained in power until its integration in Indian following the countries independence in 1947. Deccan Festival - This festival is held in the month of April where talents are exhibited in the field of Music, Dance and Theatre. Ghazals, Mushairas, Qawwalis and Classical dances. Lumbini Festival - This festival is celebrated in the month of December to honour the Buddhist Heritage of Andhra Pradesh. It takes place in the Nagarjuna Sagar. Other common festivals celebrated here include Makara Sankranti, Moharrum, Ugadi, Vinayak Chaturthi and Diwali. 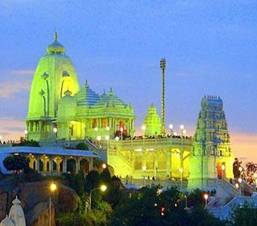 This is a very famous temple situated on the top of a small hillock in Kala Pahad, at a distance of about 1 Km from Hyderabad railway station. The main feature of this temple is its beautiful architecture which is constructed fully in white marble. This temple houses the idol of Lord Venkateshwara and it s magnificent in the night lights. Chote Hazrat Ki Dargah - This old dargah was built in remembrance of Hazrat Ali who was the son-in-law of Prophet Mohammad. It is located in a place called Devan devadi.This dargah is supposed to be a very sacred pilgrimage spot which is visited by hundreds of Muslims everyday. You need a rough climb of about 400 stairs to reach the daragh but once it is reached, you will realize that it is worth climbing. Mecca Masjid - This mosque is locate near Charminar and it is one biggest and the oldest most with magnificent architecture in this area. It nearly took 77 years to build this mosque. The mosque can even accommodate nearly 10,000 people for single sitting. The Mecca masjid also has a store of ancient relics. There are also beliefs which say that the mosque has the hair of Prophet Mohammed. This is one of the beautiful churches in Hyderabad built with the Italian architecture. The main feature of the church which is located in the Gun foundry is the bell tower on the top of the church. The bell is supposed to be got from Italy and it is believed to safe guard us from lightning and thunderstorm. 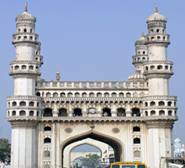 Charminar was built by the founder of the city which was erected in 1591 as an expression of joy and gratitude at the termination of the plague in the city. Its four minarets at the corner rise to a height of 56 metres and from its top the view of the city is superb. This place is located in the heart of the city. About 8kms west of Hyderabad is the massive Golconda Fort. The fort has massive spiked gates, 87 bastions, palaces, Darbar hall, stabes, harem, grain, silos; barracks etc. The fort is also famous for its excellent acoustic system. A clap made in the portico can be heard in the Durbar hall. 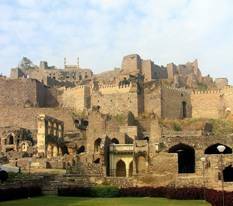 Golconda was also once famous of its fabulous diamonds and the renowned Diamond Kohinoor was unearthed from this region. This is one of the seven wonders of Hyderabad. This is located at a distance of about 2kms from the Golconda fort which houses the cemetery of the Qutub Shahi kings. These tombs are constructed with a blend of Indo-Persian and Deccan architecture. The architecture involves domed structure covered by pointed arches on an elevated square. They are quadrangular in shape which goes upto 9-15 meters high above the terrace. The Paigh tombs belong to the 18th century which covers an area of about 30-40 acres. 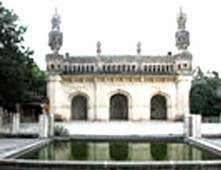 This is located at Santoshnagar, 10 km from Charminar.Paigah Tombs were mainly built to house the cemetery of the family members of the Paigahs. 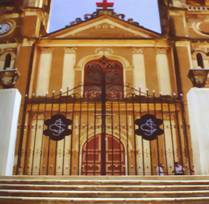 It attracts a major crowd of the tourists by its intricate designs and geometric perfection. It is claimed that these stunning tombs built with artistic taste are the best of its kind. Believed to be the best in Asia, it is a unique collection of art objects. This fabulous treasure house was given the present shape by Mir Yusuf Ali Khan, popularly known as Salar Jung, himself a great connoisseur of art. It contains wonderful art objects, statue by master Italian sculptor and is rare Persian miniatures, illuminated Koran and the like which provide joy to the beholder. This museum is situated in Afzal Gunj. Birla Planetarium located in the heart of the city of Hyderabad on the panoramic hillock of Naubat Pahad is supposed to be one of the best in the country. It is equipped with advanced technologies to study the astronomy for the visitors. Recently a dinosorium museum is added which includes collections of smaller fossils of dinosaur eggs. This is one of the largest man made lake popularly referred as Tank Bund is located at a distance of about 1.5km from the city. The special feature about this lake is that it connects the twin cities namely Hyderabad and Secuderabad.Another feature of the lake is the 16 meter. tall monolithic Buddha statue. This is made of white granite and is supposed to be the largest statues in all over the world. This lake is located at a distance of about 20kms away from the city and it s major supply of water for the twin cities. The added attraction of this lake is a vast landscaped garden and a swimming pool. This park is very close to the Hussain Sagar lake at a distance of about 3kms from the city. 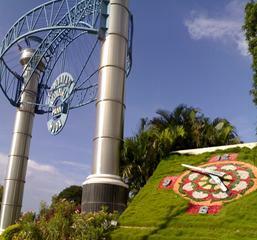 The main tourist attractions in the Lumbini garden include a colourful floral clock, waterfalls and fountains. The spectacular musical dancing fountain and water cascade draws huge crowds. This is located in the Necklace Road, capturing an area of about 99 acres and is named after the the former President of India, Mr. Neelam Sanjeev Reddy.This locally referred lovers park is housed with a rose garden, a rock garden and a floral clock which attracts the tourists. This park is located at a distance of about 16kms from the city in as area called Bahadurpura.This zoo which covers an area of about 300 acres is supposed to be one of the biggest of its kind in the country. This zoological park is housed with exotic species of animals and birds, Lion Safari Park, Natural History museum and Museum of Pre-historic Animals. This park is located near Osman Sagar Lake is at a distance of about 15 Kilometers from Hyderabad. It is built with latest technologies and engineering which can compete with world standards. The park has a water sports section and another one for amusement games. There are popular rides for both kids and old people. This amusement is again close to 15kms away from the city. The treasure entertains you with fun oriented activities like horse riding, billiards, dancing at the disco, go-karting, swimming pool and so on. There are also bamboo cottages for overnight stays. 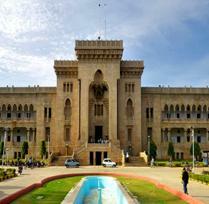 The University named after the Nizam Mir Osman Ali Khan was established in 1918 and for several years it was situated in various buildings, finally in 1939 shifted to Arts College. It is fine piece of Architecture with a blend of Indo-Persian and Arabic style. Nagarjunakonda is located at a distance of about 150 kms. from Hyderabad. This is a famous pilgrimage center for the Buddhists and is also known for its Buddhist architecture. The ruins at Nagarjunakonda include temples, stupas, pillared pavilions and marble portrayals of the Buddha's life. Bidri Work - Abids How To Reach This Bazaar? Venkatagiri, Siddipet, Gadwal, Naryanpet and Dharmavaram,Pochampalli saree centres - MG Road, Patny Circle, General Bazaar, Abids, Nampally, Somajiguda, Charminar, Koti, Sultan Bazar, etc. Embroidered sarees, Lacchas(Long tops paired with long skirts and dupatta), ghagra and cholis (skirt and blouse), salwar kameez and even sandals with embroidery work - Charminar. Hyderabad caters both national and international flights. The domestic terminal is called the N.T. 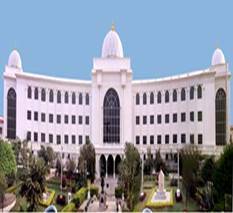 Rama Rao Domestic Terminal from which services are rendered by the domestic airline companies like Indian Airlines, Jet Airways, Air Sahara, Deccan Airways, Kingfisher Airlines and Spice Jet. The international terminal is called the Rajiv Gandhi International Terminal in Begimpet. Major international flights operating here are Lufthansa Airlines, SilkAir Airlines, Malaysian Airlines, Emirates Airlines, Saudi Airlines, Sri Lankan Airlines and Qatar Airlines. 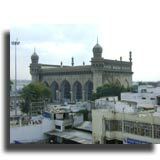 Hyderabad is the headquarter of South Central Railway. There are a number of daily express trains from Hyderabad to the other cities of India like Bangalore, Bhubaneswar, Mumbai, Kolkata, Delhi, Chennai and other major cities in Andhra Pradesh and India. Hyderabad, being Capital city is well connected by Road from all major cities in Andhra Pradesh and Karnataka, Tamil Nadu, Maharastra and Odisha.It has got most of the national highways running throughout.